The Choral Society of Pensacola will celebrate Xiaolun Chen’s 20th season as its artistic director with a reception set for 5-7 p.m. Thursday, June 21, in the Palafox House at 196 N. Palafox St. 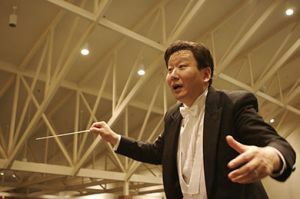 In addition to conducting three or four concerts a year with the Choral Society, Chen has taught and served as director of choral activities at Pensacola State College since 1998. Past and current Choral Society singers, board members, donors, concertgoers and members of the community are invited to the reception which will include brief tributes and time for conversation, accompanied by champagne and light bites from the Culinary Contessa. A native of Beijing, Chen has two master’s degrees from the Eastman School of Music ─ one in choral conducting and one in vocal performance. He also has eight years of teaching experience at the Louisiana School for Math, Science, and the Arts. Reception sponsors include The Fish House, Jan and Ralph Peterson, Nancy Blanford, Barbara Lewis and The Hawley Trust. Admission is $50 for one guest, and $85 for a couple. Tickets are available at www.choralsocietyofpensacola.org or by calling 850-484-1806. Donations made in Chen’s honor will fund a scholarship for young singers or prizes for the Choral Society’s first Young Voices competition set for Oct. 20. The Choral Society of Pensacola is funded in part by the Florida Department of State, Division of Cultural Affairs; the Florida Council on Arts and Culture; Art, Culture, and Entertainment, Inc.; Pensacola State College; and area businesses, corporations and individuals. For more information, contact Charlie Smoke, executive director of the Choral Society, at charlie@choralsocietyofpensacola.org or 850-484-1806.